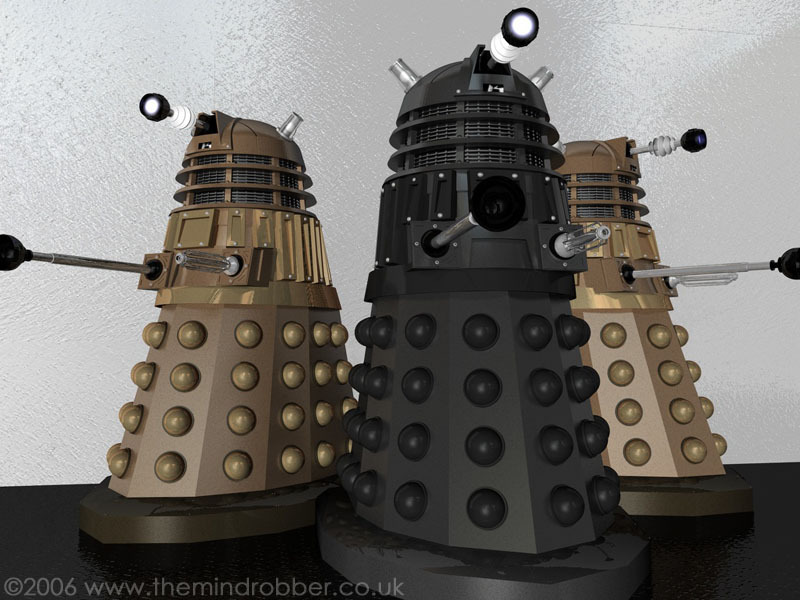 The above image is my render of the Black Dalek of the new series and his bronze soldiers. The rest of the images on this page are from Army of Ghosts and Doomsday. 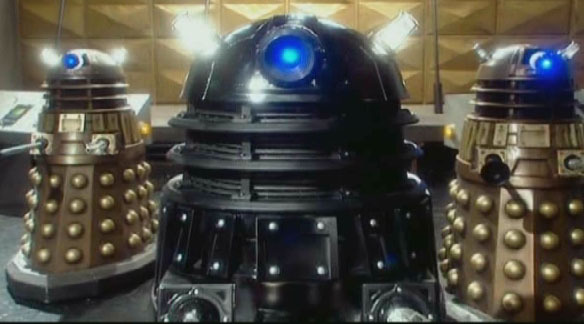 The Black Dalek first appeared in The Dalek Invasion of Earth as the commandant of the mining operation. His second appearance was in The Chase, albeit fleetingly, where he was at the centre of an operation, presumably on Skaro, where a time machine had been developed and a squad of Daleks was deployed through time to seek out the Doctor and his companions. The third appearance of the Black Dalek, or Dalek Supreme, was in The Daleks Masterplan when Dalek operations had seemed to move to Skaro and this Black leader of all others oversaw the creation of the time destructor. There was then a long gap before the Black Dalek supreme appeared once more, although there were so-called Black Daleks in Evil of the Daleks, these units had only black heads and seemed specifically loyal to the Emperor. 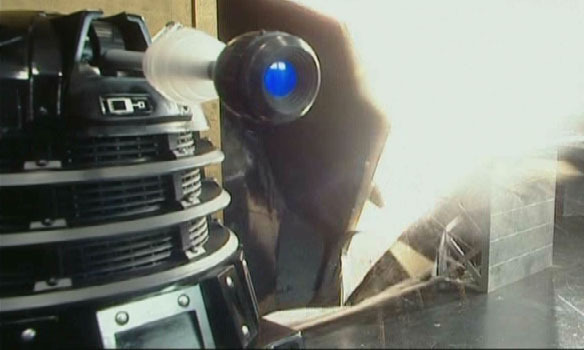 The Dalek Supreme appeared in Ressurrection of the Daleks in which the civial war between the Dalek factions began, with the Black Dalek seemingly having replaced the Emperor at the top of the Dalek Hierarchy. Finally, reduced to little more than the leader of a bunch of rebels, the Black Dalek made his final appearance in Remembrance of the Daleks which resulted in him self destructing when all seemed lost. 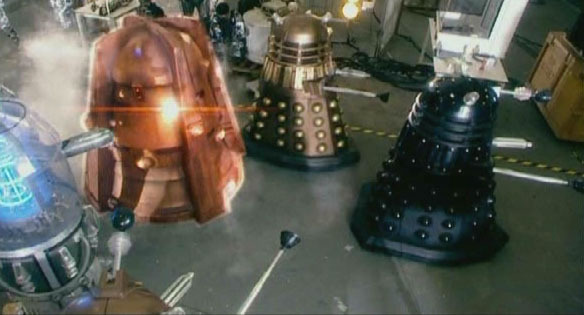 We got our first glimpse of a Black Dalek in the New Series style during the 2006 Bafta awards ceremony but he was finally revealed in all his glory, and after months of speculation, in the final moments of Army of Ghosts. On this DVD you can see the original Black Dalek in his first appearance as he oversees the mining operation in the Dalek's most bizarre plan of all time! 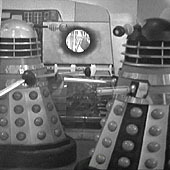 In this brilliantly restored DVD, the Daleks return for their second appearance in Doctor Who. Featuring famous scenes on Westminster Bridge and with new impressive CGI Dalek Saucers over London, this DVD release is a must for anyone interested in the Daleks. Featuring the first Doctor, William Hartnell, and being the final appearance of his granddaughter Susand, this exciting six-episode adventure travels from the banks of the Thames to the heliport where the Dalek saucer has landed, to the the mine where the Dalek's mad plans are revealed! Keep this website out of direct sunlight. This website may contain nuts. Your nuts are at risk if you do not keep up repayments.